Mixer logic coming along okay, still a bit WIP but fun! More WIP. The mixer is now producing Junk material when it has unknown or bad material combinations. When I connect the sugar conveyor, it starts producing mixed chocolate. When I delete the sugar conveyor, it has a bad configuration and requires a purge (light goes red). I am a little worried this will be hard to parse but there is a cropped out UI that indicates a given machine's status when you select it. The lights are supposed to be a leading indicator of a problem ("Hey click me to see what's up!") then the details will guide the player to fix the problem. Splitter is now working. Most of the complex machine types are done, woohoo. This is looking so great, can't wait to see it all gussied up with Jon's models! We have finished chocolate bars! Need to finish the packing and palletizing machines, then onto "with nuts or rice" variants. Then when the player produces these milestones, output a little score based on time it took, number of machines they used, maybe rate based on overall factory footprint, etc. The end game will probably be fairly anticlimactic, in the wheelhouse of Sim City's "Hooray you are now a Small Town!" or whatever. @coughlinjon 's models are inbound and tearing it up on the manufacturing floor. New UI in as well. This is shaping up! Note: Sandbox mode might get scrapped depending on how tomorrow goes! Tomorrow's goal is to get user prompts finished so the player knows what to do, and the game detects when they did it. Bonus if challenge scenarios #2 and #3 can get in as well. I did the thing! This was my second attempt. The first time I was very confused and produced a whole lot of waste. The first time, I used the splitter and had three lines of production going, but since the game calls for a single pallet to be made, on my second attempt I just had the one line of production to produce a single pallet. Now I'm not sure if I'm supposed to be able to feed a palletizer from three conveyors, but that didn't seem to work the first time and added to my waste. Really cool game though! Alas, I ran out of time. But I am really glad you made it to the end, confusion aside. It is satisfying to see that the tutorials and stuff hopefully made sense, and you "beat the game" Yay! I built the chocolate! Yay. 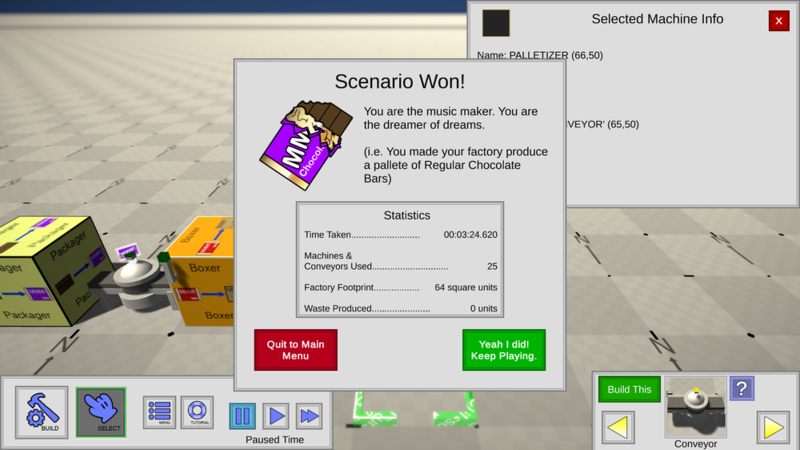 FYI keen manufacturers of fine chocolates, I have updated the game with a couple minor bug fixes and 2 new manufacturing scenarios: Crispy Chocolate Bars and Nutty Chocolate Bars! 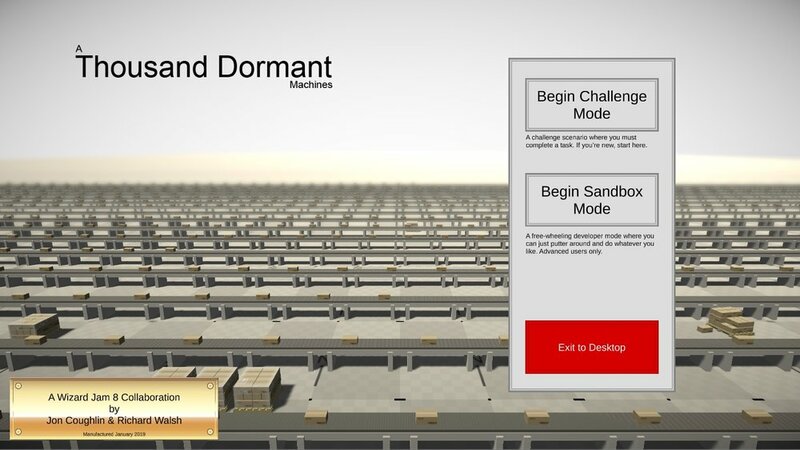 Hooray, you can beat the initial challenge, then re-tool the meet these two new challenges. Have fun! I managed to beat the first challenge also, though I didn't try for the advanced ones. The controls looked kind of intimidating from the description, but with the tutorial it was actually pretty intuitive. As far as UI goes, it might be easier to select different parts to build from a grid instead of cycling through one at a time. Really impressive work! I agree that a grid type object list would help make things easier, but mechanically the game works really well. Thanks to you both for playing!